Linda: One of my favorite photos of those I’ve taken myself is of a yellow Piper Cub snuggled up to a tent along a grass runway in the misty morning sunrise. 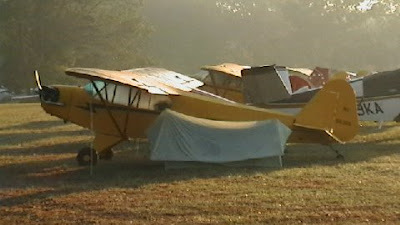 I took that photo at the first annual Ranger Fly-In, one of several very popular Fly-in/Camp-outs. Mike: Being a backpacker and climber accustomed to carrying a load on my back, I find that this kind of camping fits well with the camping-by-airplane mentality. Weight is always a consideration – though I did dream about converting the DeHavilland Twin Otter I used to fly into what I called a "Winged Winnebago" complete with car in tow. The Twin Otter has such great short take-off and landing capabilities that it could be shoehorned into the shortest of strips, with a huge cabin and payload to boot. I find it an interesting concept that still begs for development. Payson, Arizona, right below the Mogollon Rim (otherwise known as the Tonto Rim if you read Zane Grey novels), has a fly-in campground at the local airport. Its 12 campsites take advantage of some of the prettiest country I’ve ever seen. California’s Kern Valley Airport and Lake Isabella in the southern Sierra Nevada mountains are a couple of other scenic areas catering to the flying camper. The historic town of Columbia, in California’s famous Gold Country has a camping area on its airport within walking distance of the old, picturesque downtown district. Or, for "roughing it" the Idaho back country offers some great spots to fly into and camp. Linda: They say it was a starlit evening about a decade ago when a small group of Montana pilots sitting around a campfire on a backcountry airstrip shared their concerns about the future of these little airfield gems. One of them, John McKenna, wrote that this group had experienced "the rare opportunity to enjoy the combination of flying and stopping off in places that have little in the way of conventional aviation facilities." No FBO, no nearby motel, "not even the old Buick courtesy car," says McKenna. "But there was the smell of pine trees, cowboy coffee, wood smoke, the distant howl of a coyote and the flicker of fire light." They knew these places were special and that someone needed to protect them. They formed the Recreational Aviation Foundation – hard workers committed to the cause, without room in their vocabulary for the words "You can’t do it." I appreciate that. Mike: Back country airstrips are recognized as an appropriate use of National Forest System lands. Other recreational facilities require hundreds of miles of roadways, but airstrips are low impact requiring minimal disturbance of the natural landscape, while serving as internal trailheads for remote areas. In 2009 the U. S. Forest Service signed a directive acknowledging the history of aviation use and airstrips on forest service lands, began inventorying landing facilities and dedicating efforts to maintain them in support of aviation. Earlier this month, the governors of Minnesota and Vermont signed bills adding aviation to their respective state recreational use statutes, becoming the 15th and 16th states to do so, thanks to the efforts of the Recreational Aviation Foundation. As summer approaches, the largest airplane camping event is on the horizon. AirVenture in Oshkosh, Wisconsin will host thousands of fly-in visitors and campers as it does every year, showing how campgrounds at publicly owned airports offer another way for communities to draw business to them using their airport. Mike: It’s been nearly five years since the FAA extended the mandatory retirement age for airline pilots from 60 to 65. Now the thousands of airline pilots who were close to retirement then will be leaving the cockpits of major and regional airlines, both passenger and cargo, creating a surge in the need for new pilots. Regional airlines are already seeing a diminished pool of qualified applicants, and the competition has some companies offering significant signing bonuses. Many newly retired pilots will go on to fly for corporations, charter services, or on-demand cargo companies. Some will teach flying, some will retire to their own hangar and maybe a low-and-slow Piper Cub, or build an airplane of their own – maybe an RV. I can’t imagine any pilot walking out of the cockpit and the industry altogether, but that’s just me. Occasionally, I suppose it happens. If you or someone you know is interested in flying for an airline there are some great schools I’d highly recommend: Purdue University (Indiana), Embry-Riddle (Arizona and Florida), and the University of North Dakota are some of the top schools offering professional pilot degrees, Bachelors and Masters. Embry-Riddle also offers doctoral Degrees in Aviation and in Engineering Physics. In the Great State of Texas we have a couple of Embry-Riddle campuses without the flight training part, so anyone interested in one of many other areas of the aviation industry are well served. Often called the "Harvard of Aviation Schools" Embry-Riddle has plans to open a third flight training campus and Houston’s Ellington Field is one of two locations being considered. Linda: There’s also Texas State Technical College (TSTC) in Waco, and they just cut the ribbon May 3 on a new 82,000-square-foot, multi-million dollar facility, the Col. James T. Connelly Aerospace Center. TSTC has long had a strong aviation program, offering five different tracks: aviation maintenance (airframe and powerplant mechanics), aircraft pilot training, avionics, aircraft dispatch, and air traffic control. They now have state-of-the-art classrooms, labs and flight simulators. The building also includes a public airport terminal adjacent to the TSTC Waco Airport. Dr. Elton Stuckley, President of TSTC envisions the new Aerospace Center as "a hub of the TSTC Airport, not only for our students, but also for the general aviation and business aviation communities of Texas." These new digs give them enough space to offer proficiency and recurrency training for general aviation pilots and also for aviation professionals. They offer continuing education and the FAA-sanctioned aviation safety training courses. For the population at large their outreach in educational and community conferences impact far beyond the airport property lines, making the airport a very active community member with a significant presence. Historical displays in the new building honor the rich history of the airport and its importance to the local community, the nation, and the world. The school’s industry partners – those who will employ graduates – will benefit from all this great stuff, meaning eventually we all benefit, because as you know if you read this column fairly regularly, airports are a vital community asset which benefit people who don’t fly. With innovations in flight training and one of the most modern training facilities in the country TSTC is preparing to meet the pilot shortage head-on. Mike: On February 17, 2009 we brought you the story of a JN4-D "Jenny" at Kickapoo Downtown Airport in Wichita Falls, and the only two people permitted to fly it for its new owners, the City of Wichita Falls, David Martin and Tom Danaher. At a recent gathering of antique airplanes in Pauls Valley, Oklahoma we discovered another piece of this fascinating historical puzzle, a man named Chester Peek. Born November 11, 1920, Chester served with the Army Air Corps in Europe during World War II. Upon his return to the states he and his wife Marian raised two sons while he worked as an engineer for a Frigidaire distributor designing commercial refrigeration plants throughout the Midwest. Chester later returned to college where he completed his Doctorate of Engineering and later became the head of Oklahoma State University’s MBA program, retiring in 1989. Mr. Peek has owned more than 31 different airplanes over the years, many of them he restored, including a JN4-D "Jenny". We met him when Linda struck up a conversation with him and his lovely bride at a table full of books he has written over the years. Linda: Chester told us about Ray McWhorter, returning WWI Army barnstormer who bought a "new" surplus Curtiss JN4-D "Jenny" on July 29, 1919 for $4,650 from the Herring Motor Company in Des Moines. McWorter told them, "don't wrap it up boys, I'll fly it home the way it is," and he did. He flew that Jenny around the Midwest from his family farm in Iowa for more than two years as a barnstormer giving rides and aerial demonstrations like wing walking stunts at county fairs. In 1921 a mid-air collision during a wing walker exchange in rough air over Mason City nearly killed McWhorter. The plane was hauled to his farm where it remained in a barn for 50 years. In 1970, Ray McWhorter gave the parts to a man named Dean Gilmore, saying, "You know this old airplane is valuable and there isn’t enough money in the world to buy it from me. But I’ll give it to you because I really believe you’ll restore it." Thus began the 12 year restoration journey. Dean Gilmore worked meticulously on the Jenny and had completed about 60 percent of the restoration when he unexpectedly died in 1982, a shock to his family and community. To settle his estate they had to sell the Jenny. The family placed an advertisement in Trade-a-Plane where Chester saw it, called and eventually when to see it. He told us that all his life he had wanted a Jenny, and when he saw this airplane his heart just ached because he knew they could not afford it. He came home and told Marian about the airplane. She simply said, "If you really want a Jenny, this is probably going to be your only chance to get one." So they made the plunge and completed the work that Dean Gilmore started. The airplane took flight for the first time on October 6, 1987 with Chester Peek at the controls. His first passenger would be Marian. The plane was eventually sold to the City of Wichita Falls, but Chester’s family’s name will forever be linked to the airplane. The entire story can be found in "Resurrection of a Jenny" by Chester Peek. Linda: We heard some great stories over the weekend and they’re the kind too good not to share. The first is but another example of the generous nature we find often within the aviation community. You’ve probably heard of wounded warrior organizations and the good work done through them as so many veterans return home with serious injuries. Captain Crawford: I was invited to fly my Lancair Legacy, “Spirit of America”, painted in stars and stripes, in the opening ceremony. Two O1 Birddogs and five T-34s would fly formation flights. The parachute jump would start the event, then we’d fly various passes over the landing zone, then I’d fly the last pass at high speed to close the aerial program. Thursday night I learned the jump plane scheduled to take the three up Friday morning had cancelled. They asked if I knew anyone who could fill in. I thought of Bobby and AnnElise Bennett. I called Mighty Mouse (a/k/a Bobby Bennett – he has earned quite a reputation among pilots as one who can be called upon to “come to save the day”) and after explaining the situation I asked if they could make it to Mineral Wells with AnnElise’s Cessna 182, “X-Ray,” for a jump Friday morning. They said yes, and AnnElise flew in to Mineral Wells early Friday morning for the briefing and had the honor of taking these men up to 10,000 feet for the jump. As usual, AnnElise and Mighty Mouse came through on short notice. Thursday night Bobby put the jump platform on X-Ray and had the plane configured for the jump. Friday morning AnnElise showed up and was able to pull off what I think was the jump of a lifetime for Sgt. Petry. I guess the most important thing is that whenever any of us have a chance to participate in a wounded warrior program, either donating our time or money, we should try and do it. What these young warriors have sacrificed for the freedom we have should not be forgotten. It was an honor to have met them. Mike: Dana Bowman’s website is www.danabowman.com. Mike: What does “drone” mean to you? What it means to a beekeeper differs from its meaning to a pilot. To a pilot it is an Unmanned Aerial Vehicle (UAV), and the present administration has mandated the FAA release more of these aircraft into the National Airspace System for law enforcement, military and commercial purposes over the next few years; as many as 30,000. These little boogers (actually varying in size, but as little as four pounds) can be programmed to fly a specific route, pattern, or they can be flown from a remote console. When asked to comment on sharing the airspace with UAVs pilots have expressed concerns first on the grounds of safety and second on right-of-way and legal restrictions imposed on real pilots as a so-called way to deal with the safety issue. Pilots will tell you that theoretically we don’t mind sharing the airspace, but only as long as the UAVs have some means of “seeing” and avoiding human-piloted airplanes better than pilots can, with no additional restrictions. But that scenario doesn’t exist. Imagine remotely controlled vehicles, too small for you to see before a collision, entering your airspace without equal or even adequate ability to see you. Scary, isn’t it? Smaller UAVs do not carry sophisticated equipment to see and avoid automatically and independently of their remotely based “pilots.” They are extremely hard to see and avoid (after all, they’re built to be stealth). And, scary as it is, some of the drone operators (seated firmly on the ground)are not even licensed pilots. What’s more, they’re more focused on buildings, borders, fences, and activities on the ground, displayed on a small screen. Linda: Reality is, they see life through a soda straw with limited situational awareness, poor visibility, and lacking maneuverability; shortfalls that make significant upgrades necessary for operating in the National Airspace System. How many UAV operators would be able to place an airplane in the Hudson River with no loss of life? They are not like real pilots, constantly in heads-up mode, scanning their surrounding for other real airplanes, controls within reach for immediate correction. What if the “kid at the console” has zipped out for a Coke or some other human moment? The kid's screen just goes blank, while the human pilot must get himself and his aircraft back to the ground in one piece. The drone doesn't care if things go wrong. This is a big issue because public safety will be affected. The greatest danger may be if the UAV “goes stupid”, meaning the communications between the ground and the UAV are severed or interrupted. There may be nothing the operator can do to restore the signal once it is lost and eventually crashes. When communication is lost with the UAV it goes into a pre-programmed escape, not controlled by a human. Privacy rights bring lots of questions too. If the drone sees your kid running a stop sign, will you hear about it? Will USDA use drones to see if you’re buying raw milk? What if someone uses a drone to spook your cattle or passes over your chicken shed and frightens all the birds that then stampede and smother each other? Can you shoot down a drone that flies over your deer blind? Can you use one to lure deer to your blind? Lots of questions, and for now, inadequate, dangerous answers.